Before 2012, documents and maps relating to Norwegian landscape architecture since around 1900 were kept in several Places around the campus at Ås. They were in a very bad condition and inaccessible to most people. The full contents of these materials were unknown. Only several master’s and PhD theses used parts of these materials as research data, which partially revealed the values of the archives. In 2012, the Archive of Norwegian Landscape Architecture received 2 million Norwegian Kroners from NMBU’s Research Infrastructure Grant. 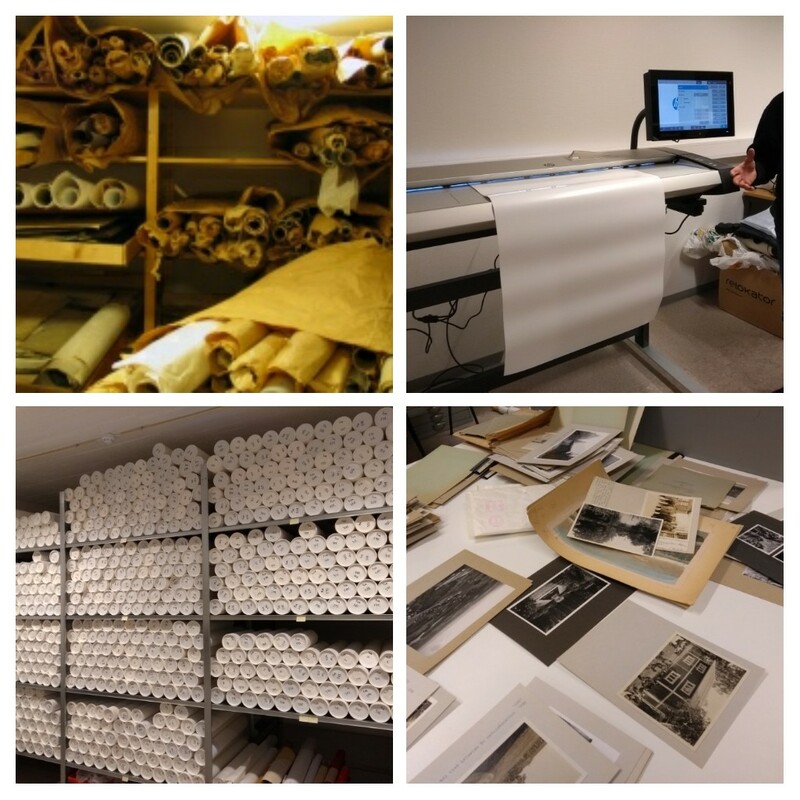 With this grant, we first established a reference group, including people from Riksantikvaren (Directorate for Cultural Heritage), Nasjonalmuseet-Arkitektur (The National Museum – Architecture) and NMBU’s communication department, to discuss the best solutions for the documentation of the archives. In addition, we contacted the Rapperswil University of Applied Sciences, Switzerland, who had the only archive for landscape architecture in the world at that time. The knowledge transfer from these national and international institutions was important for the long process of establishing and managing our Archive. We also used parts of the grant to document and register all our collections, helped by the firm Stiftelsen Asta. Together with the NMBU technical administration, we found a suitable place for storing the archives. In 2013, all collections were moved to the new rooms in the so-called Meieri-building at campus Ås. The Archive was officially opened in May 2014. Since the opening of the Archive, we have been receiving new collections (Bjarne Aasen and Toralf Lønrusten) and have continued organizing the documents. In addition, we upgraded the infrastructure. In January 2018, a new large-format scanner was set up in the working room next to the Archive’s main room. This scanner can now be used to digitalise the most important maps in different collections. This is an important step to prepare for the 100 years jubilee of the School of Landscape Architecture in 2019. The collections of the Archive illustrate the development of Norwegian landscape architecture in the past 100 years, both in education and in profession. The variety of sources from former teachers and landscape architects in addition to student works back 100 years ago will be used for book publications and exhibitions during 2019. That’s wonderful news Annagreth – congratulations to all involved. We need more such archives, more records digitised and made available – even knowing what exists, where, is helpful. Bravo. Thank you so much, Stuart. We will continue this important work. Stay tuned. New post coming soon! Fantastic news for all of us! Congratulations from Norges grønne fagskole – Vea. I’m glad we could contribute helping to scan the most fragile material on our vacuum scanner. Looking forward to see the exhibition next year!